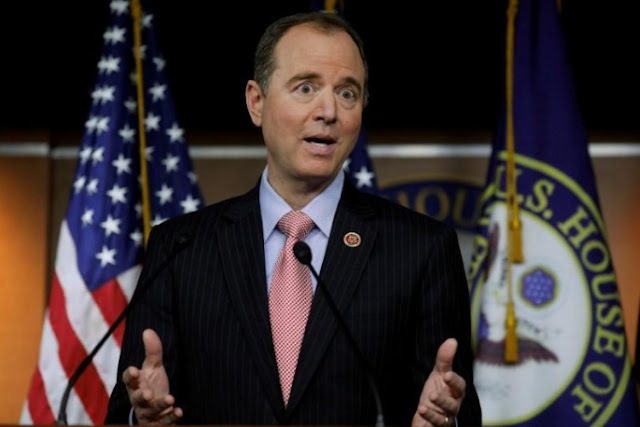 FILE PHOTO: House Intelligence Committee ranking Democrat Adam Schiff (D-CA) reacts to Committee Chairman Devin Nunes statements about surveillance of U.S. President Trump and his staff as well as his visit to the White House, as Schiff holds a news conference at the U.S. Capitol in Washington, U.S., March 22, 2017. WASHINGTON - Top Democrats in the U.S. House of Representatives are refusing to endorse a Republican move to find out who paid the research firm that commissioned a dossier alleging ties between Donald Trump’s campaign and Russia, a court document made public on Monday night showed. The split is the latest sign of partisan feuding that current and former U.S. officials say is undercutting a House Intelligence Committee probe into Russia’s reported interference in the 2016 presidential election. Republicans on the committee earlier this month subpoenaed an unidentified bank for the last two years of records of the accounts of Fusion GPS, the political research firm that hired former British intelligence officer Christopher Steele to pull together the dossier on Trump. The move was an apparent effort to find out who had paid for the work that led to the dossier. The firm assures its clients it will not disclose their identities. Late last week, Fusion GPS sued the unnamed bank in federal court in Washington, requesting a court order to block the subpoena. In Monday night’s court filing, lawyers for the House of Representatives, saying they represented the Intelligence Committee, asked the court to reject Fusion’s request. But the legal challenge was made without support from Democrats, throwing into further question a tradition of bipartisanship in Congress on intelligence issues. Democrats, who are in the minority, and some Republicans on the House panel, want to investigate Russia’s role in the 2016 election, as well as allegations - so far unproven - that Trump’s team colluded with the Kremlin. Rep. Devin Nunes, the Intelligence Committee’s Republican chairman, and his allies have focused instead on other issues, including the activities of Fusion GPS. A footnote in Monday’s court filing says that House lawyers went to court to enforce the subpoena with the authorization of the Bipartisan Legal Advisory Group of the entire House. Rep. Nancy Pelosi is the House Democratic leader, and Rep. Steny Hoyer is the Democratic whip. The top Democrat on the Intelligence Committee, Rep. Adam Schiff, was not immediately available for comment. In their court filing, the House lawyers argue that Fusion GPS has no right to quash a valid congressional subpoena. “The relief Plaintiff seeks is extraordinary and would directly impede an ongoing congressional investigation of the highest national importance,” they wrote in the filing. The court filing confirms that Nunes retains control of the committee’s Russia investigation, despite saying in April he would step aside and let fellow Republican Rep. Mike Conaway take charge. Nunes “did not ‘recuse’ himself from the investigation,” the document says. Top Democrats in the U.S. House of Representatives are refusing to endorse a Republican move to find out who paid the research firm that commissioned a dossier alleging ties between Donald Trump’s campaign and Russia, a court document made public on Monday night showed. The split is the latest sign of partisan feuding that current and former U.S. officials say is undercutting a House Intelligence Committee probe into Russia’s reported interference in the 2016 presidential election.